Now, this is a great topic. We all love those heroic mounts that take our favorite hero into battle. I mean, there has to be a lot of these out there, right? Let’s see which ones we can find. If you are going to start listing beloved mounts Shadowfax must be on the top of that list. 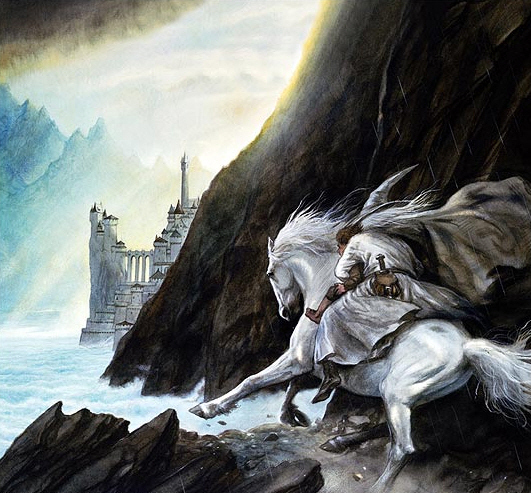 The Lord of Horses was said to be the greatest steed of Middle-earth. He was so intelligent that he could comprehend human speech, and the legends suggest that he could outrun the wind! Untamable by the Rohirrim, he was later given to Gandalf the White by Théoden, the 13th king of Rohan, and strode upon the fields of the mighty during the War of the Ring. Yeap, old Shadowfax. He is a legendary mount. He almost makes me wish I could ride a horse. Buy The Lord of the Rings: 50th Anniversary, One Vol. 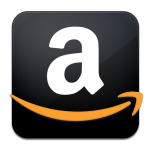 Edition at Amazon. 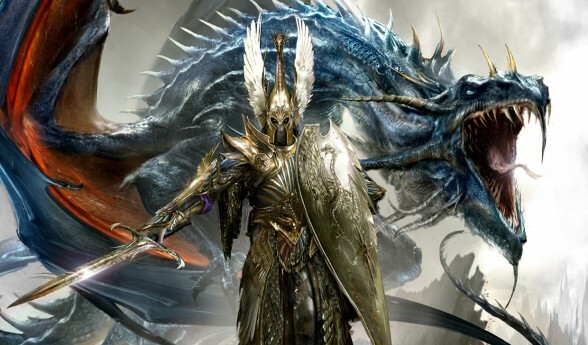 Mightiest of the ancient dragons who were awakened by Caledor Dragontamer, Indraugnir was both the mount and companion of the Phoenix King of the Elves in the Warhammer Universe. To say the dragon was both a boon and a curse to Aenarion sounds too prophetic, but in reality, only by the might of Indraugnir was the Phoenix King able to accomplish an impossible deed that cursed both him, his family and the whole world. While others point out that with his dying breath Indraugnir took Aenarion back to the site of the ill deed to rectify it somewhat and save the world from total destruction, it might be said that such prowess by this mighty dragon was too little, too late. Buy Age of Legends (Time of Legends) at Amazon. The only white dragon ever mentioned in any of the Pern books, Ruth is a unique dragon for many reasons. First, his hatching was very peculiar, as young Lord Jaxom actually aided his emergence from his shell. Two, Ruth’s small size causes him to be ridiculed by most other dragons. And three . . . well, let’s just say Ruth turns out to be a very gifted dragon. For all those reasons (plus his humorous personality), Ruth has always been my favorite dragon of Pern. 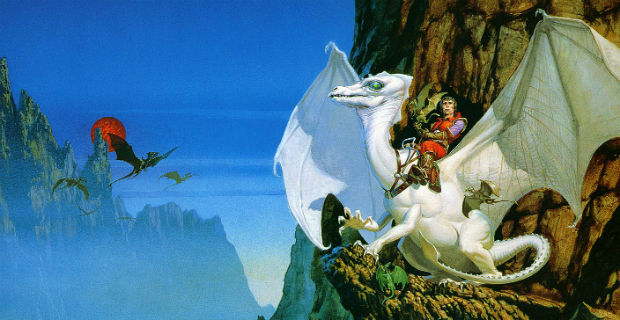 Buy The Dragonriders of Pern: Dragonflight, Dragonquest, and The White Dragon (Pern: The Dragonriders of Pern) at Amazon. 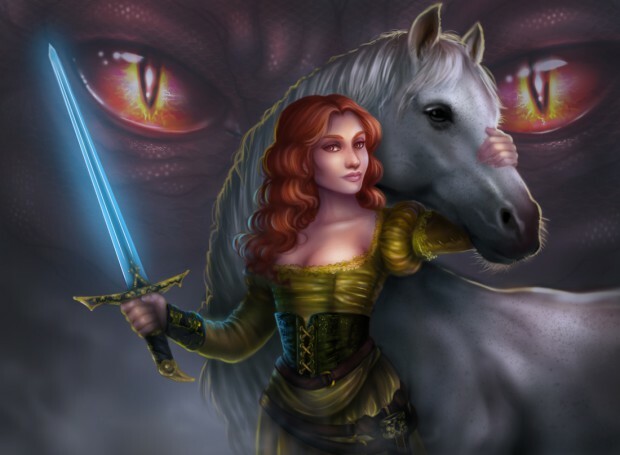 Whenever a warrior is going out to do battle with vicious, fire-breathing dragons, it is always good for him (or her) to have a steadfast steed along to help out. And young Aerin finds that steed in her father’s old warhorse Talat. As the story progresses, Aerin and the readers begin to understand not only the bond these two companions have for one another but the importance Talat plays in everything Aerin does. For I am not exaggerating when I say that Aerin would not have survived her adventures without good, old Talat along to ride. Buy The Hero and the Crown at Amazon. Okay, I have to admit it: I actually like Percy Jackson. At first, his novels were just some interesting stories to read my kids at night and get them to fall asleep, but along the journey from The Lightning Thief to The Last Olympian Seaweed Brain grew on me. So much so that I’ve been trying to convince my sons to read some more of the novels. One of my favorite characters in the series is old Blackjack. 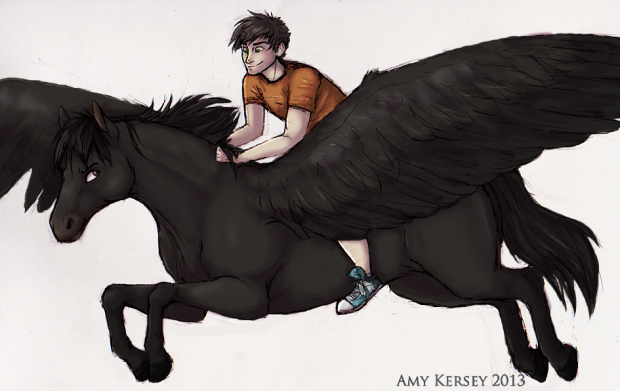 Not because he has a large role or is included in all the action, but because who wouldn’t like to soar the skies on a black Pegasus. It would be a childhood dream come true for me, at least. Buy Percy Jackson and the Olympians 5 Book Paperback Boxed Set (new covers w/poster) (Percy Jackson & the Olympians) at Amazon. Sparhawk is a grizzled, veteran knight who has been at the heights of power only to find himself banished from his own homeland. Many fear him, but all respect him — except for his warhorse Faran. This horse is a spirited steed, who finds ways to communicate his displeasure to his knightly master. To say the two of them have a less than happy relationship is an understatement, but perhaps this isn’t all Faran’s fault, because the child-goddess Aphrael once tells Sparhawk that Faran only has a bad temper because he is trying to duplicate Sparhawk’s own. But no matter their differences (or similarities), Faran is a steed and companion who Sparhawk can always depend on when things go wrong. And they always seem to! Buy The Elenium: The Diamond Throne The Ruby Knight The Sapphire Rose at Amazon. This is a list of animals, right? How could I go a whole list and not include at least one anthropomorphic animal from The Chronicles of Narnia? Well, obviously, I couldn’t. I mean, it is impossible. 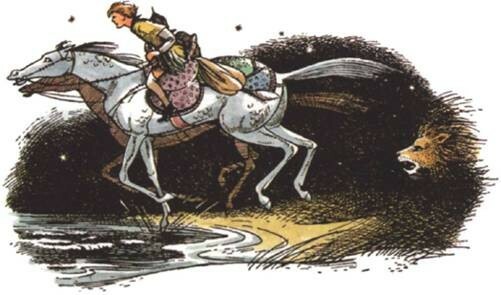 And Bree is the Narnian beloved steed I have to point to. A horse that rescues a young boy from slavery, helps him escape from his pursuers, and teaches him more than a few lessons along the way. Bree is definitely a steed that any person would love to have, especially a youth in need of love and guidance. Buy The Horse and His Boy at Amazon. To this point in the list, we have dealt with several trusty steeds. Whether they were horses or dragons hardly matters, since, in their relationships, they were all definitely the one carrying the human or elf around. But in Mr. Rowley’s military fantasy adventure Bazil Broketail, the tables are turned. Needless to say, this series was a great twist on the usual human-dragon relationship. But just so you know, the orphan boys still ride to battle on the backs of their battle dragon (though these dragons are hardly mounts), so technically, I’m including Bazil on the list. Buy Bazil Broketail at Amazon. This entry was posted in Fantasy, Lists, Tough Traveling and tagged Aenarion, Bazil Broketail, best fantasy mounts, Blackjack, Bree, Christopher Rowley, Chronicles of Narnia, David Eddings, Dragonriders of Pern, fantasy tropes, Faran, favorite mounts, Indraugnir, JRR Tolkien, Lord of the Rings, Percy Jackson, Percy Jackson and the Olympians, Ruth, shadowfax, The Elenium, The Hero and the Crown, The Horse and His Boy, The Tamuli, Tough Traveling, Tough Traveling Thursday, Warhammer. Bookmark the permalink. Shadowfax made my list as well. I still haven’t read any of the Warhammer books, but Indraugnir sounds very cool. I am totally adding them to my to-read list just based on how epic that picture you included is. I want to meet those people. They look awesome. 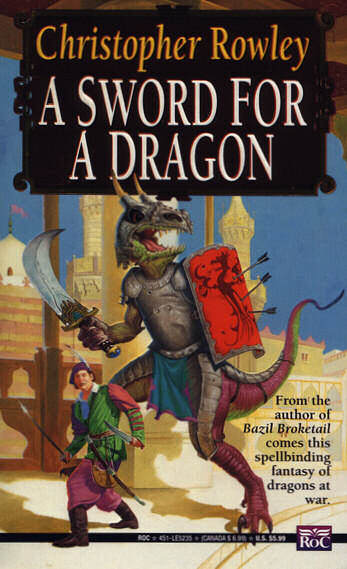 Brazil Broketail is the best old school fantasy cover to show on a list for a while. Can’t speak for anyone else, but I stopped reading the books before she started riding a dragon. Not that I don’t intend to return to the series at some point, but right now, I’m getting my Game of Thrones fix from the tv series. That’s why I still haven’t watched the series. It started diverting too much from the books. Now I’m stuck waiting for the next book. Dammit Martin, get writing!!! Oh thank you, I thought I was crazy when I said Shadowfax was going to be on all lists this week and then only 3 of us included him! Great choices! Ruth made my list, and so did Bree. Faran, Talat, and Blackjack are great picks – I picked Sungold (Tsornin) instead of Talat as my McKinly choice, but Talat is wonderful too. I love your post and your pictures are so gorgeous. Love it. OMG Indraugnir looks like the most badass dragon ever. I’m loving the illustrations that you chose for this post! There were a few lists that included the dragons from Pern…would you believe I haven’t read any of those books?! I need to get cracking on all this classic fantasy! The Bazil Broketail series sounds pretty dang awesome and I’ve never heard of it or its author! Thanks for the introduction. Glad someone else included Bree – He’s pretty awesome:).